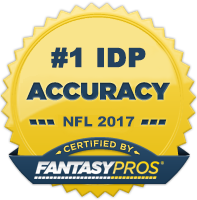 Week 14 IDP Waiver Wire darling James Sanders notched a measly one assist last week as he was benched in favor of William Moore. He's safe to drop in all formats. Fantasy studs Patrick Willis, Ray Lewis, Desmond Bishop, LaRon Landry, and Patrick Chung all missed yet another game and their statuses for this week's games remain in question. Make sure to keep a close eye on the injury report and be ready to scoop up their backups if you are looking for waiver wire pickups in deeper leagues. Bryan Scott had a monster game last week against the Chargers; however he should be left on the waiver wire. He's still only coming into the game in subpackages as a linebacker. The Chargers tend to use a lot of spread sets and consequently the Bills were in the nickel package for a majority of the game which meant Scott saw way more playing time than he usually does. Plus, he was shadowing Antonio Gates which led to a lot of his tackles. Jason Pierre-Paul was an absolute beast against the Cowboys on Sunday night registering 8 tackles, 2 sacks, 1 forced fumble, 1 safety, and 1 blocked FG. He's establishing himself as a lock for a top 5 DL pick in fantasy leagues next season. Trent Cole finally rewarded patient owners who have stuck with him all season as he notched 3 sacks and 7 solo tackles against the Dolphins last week. I'd trust Cole as a DL1 the remainder of the season. George Wilson returned to action last week with 6 total tackles (5 solo). Although those numbers weren't fantastic, he's still a DB1 play the rest of the season. The Titans placed MLB Barrett Ruud on injured reserve this week clearing the way for emerging IDP stud Colin McCarthy to be the clear cut MLB the rest of the season and beyond. If you haven't picked up McCarthy is your dynasty leagues, do it now. RDE Michael Johnson (CIN) - Johnson was an IDP sleeper favorite among many fantasy owners early in the year, however his inconsistent play led him to be taken out of the starting lineup halfway through the season and, as a result, he's dropped off the radar of most owners. Perhaps it's time to take notice again however as Johnson has had a sack in each of his last two games and faces the league's most sacked team in the St. Louis Rams this week. He's a nice DL3+ start. LDE/LOLB Aldon Smith (SF) - This is the 3rd straight week that Smith has made this list and although that seems a bit redundant, it's important to keep listing him here in good matchups as he's still available in the majority of leagues and is the type of player that is capable of putting up monster fantasy numbers. He has a matchup this week against the Steelers and a very hobbled Big Ben (or a very rusty Charlie Batch). I fully expect Smith to register at least 1 sack in this game, if not more. RDE Will Smith (NO) - Smith rebounded nicely from his two game suspension early in the year, but quickly cooled off and only seemed to have big games against weaker offensive lines (Jaguars, Rams). However, over the last couple of games, he's been more active in defending the run and has notched a sack against a couple of better pass protecting lines (Giants, Titans). He has a juicy matchup this week against the Vikings who should be down early and forced to throw often especially if AP isn't in the lineup. LDE Darnell Dockett (ARI) - Dockett has been overshadowed by the outstanding play of teammate Calais Campbell this year, but Dockett is still one of the better 3-4 defensive ends in the league and can still be a productive fantasy option in the right matchup. He's had a sack in each of his last two games and faces a Browns offensive line that has really been struggling to protect the QB as of late. ROLB Jason Worilds (PIT) - Worilds managed to bring down Colt McCoy twice last week and also threw in 8 solo tackles. With James Harrison likely facing suspension this week, Worilds becomes a great options for those in big play slanted leagues looking for the possibility of a monster week from their linebacker. The Steelers face off against the 49ers this week who have struggled to protect the quarterback. If you are an underdog and in desperate need of big points, Worilds is your best option on this list of linebackers. WLB Michael Boley (NYG) - Boley has been a consistent and productive LB3 option for owners this season. A hamstring injury has slowed him down a bit over the last two games, but the matchup this week is too good to ignore. The Redskins have given up the most points to linebackers according our IDP Points Allowed Tool and Boley should have one of his better fantasy games of the season. Consider him a LB3+ this week. WILB Larry Grant (SF) - It's still unknown whether or not Patrick Willis will be able to play this week. If I had to guess, I'd expect the 49ers to sit him unless he is very close to 100%. If this is the case, Grant will make his 2nd straight start at WILB next to NaVarro Bowman. Grant was extremely productive last week with 10 solo tackles and an assist. He's a top priority grab for those in balanced or tackle heavy leagues this week if Willis is a no-go. MLB Stephen Tulloch (DET) - There's no doubting Tulloch's tackle production has seen a severe decrease this season with his move to Detroit. He's currently on pace for about 40 less solo tackles than he had a year ago, although he has seen a slight increase in his big play production. With this said, I've noticed that he's available even in a lot of deeper leagues and with the waiver wire being pretty slim this time of year, he's a very nice LB3+ start against a top 5 rushing matchup in the Oakland Raiders this week. WILB D.J. Smith (GB) - As I've been stating since his injury first happened on Thanksgiving Day, I think Desmond Bishop's calf injury is more serious than the Packers have been leading on. There hasn't been any news yet whether or not he's going to play this week, but my gut is telling me he misses another week which means that Smith will get another start and remains a low-end LB2/high-end LB3 play. FS Malcolm Jenkins (NO) - Over the last several games Jenkins has been putting up Roman Harper-type tackle numbers and is showing no signs of slowing down. Over his last 4 games, he's averaged over 8 total tackles and should continue his productive ways this week against the Vikings especially if Adrian Peterson is able to suit up and play. LCB Jacob Lacey (IND) - Due to multiple injuries at the cornerback position, Lacey (a nickel corner talent at most) has been forced into the starting lineup. The Colts are historically bad on offense which means their defense is on the field for a majority of the game and faces a very healthy amount of tackle opportunity. The matchup against the Titans this week is middle of the road, but Lacey should still be a decent low-end DB3 play. SS Charles Godfey (CAR) - Godfrey has been up and down this year from a tackle production standpoint. However, he does have the capability to put up very nice tackle numbers playing behind a very weak set of linebackers. Expect the Texans the run the ball an absurd amount this week which should lead to a plethora of tackle opportunities for Sir Charles this week. SS Darian Stewart (STL) - Stewart has been one of the more consistent tackle options at the strong safety fantasy position this season and he has a top 10 matchup against the Bengals this week. 6-8 solo tackles is a reasonable expectation. Just keep in mind that the Rams are playing at home this week and Stewart only has 3 assisted tackles in 6 home games due to the stingy scorekeeper.